I shared a sneak peek of the issue a few weeks back, and as you can see from the cover, we’re highlighting the plight of the UK’s puffins with a story on how the people-powered Project Puffin is revealing what puffins eat and how far they’re having to travel to find food. 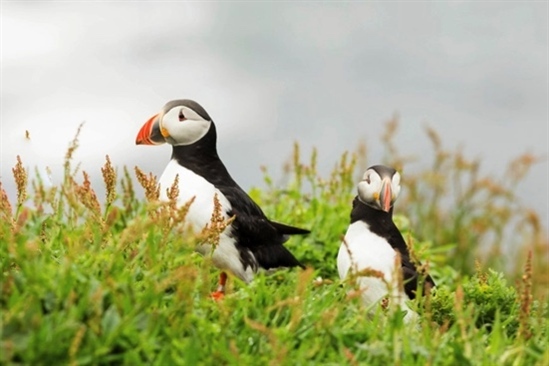 Despite being a much-loved and protected bird, Atlantic puffins are in decline and facing serious problems. Gathering this data is crucial in enabling us to understand the issues that puffins are facing, and how to help them. 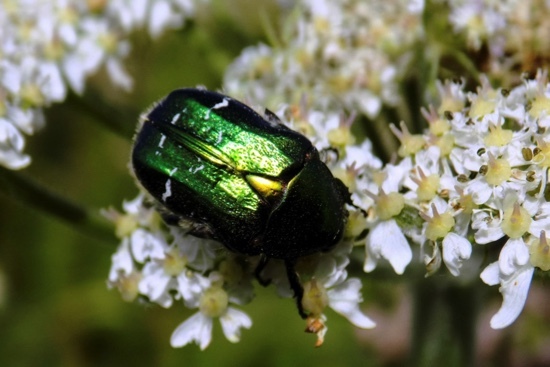 A world away from the crashing Atlantic, our ‘Neighbourhoods for Nature’ feature is packed with practical advice about how to cater for the species we share our streets with. The RSPB partnership with Barratt Developments is a stellar example of how we can cater for new housing demand without displacing nature, showing how homebuilders can incorporate structures like bat boxes and swift bricks into the structure of new buildings, as well as wildlife underpasses under main roads, nature highways, wildflower-meadow verges and bat-friendly lighting. There’s so much that we can all take away from this, even making improvements to older homes and neighbourhoods. My garden now has several gaps under the boundary fencing, in case I’m ever lucky enough to attract a hedgehog. Check out the ideas on page 32 and have a think about how you could apply them to your own streets and gardens. My desk copy of the magazine keeps falling open on the giant beewolf photo on page 56, which is a bit unfortunate as I’m someone for whom the European wasp is the stuff of nightmares, and this fellow is even bigger – with bee-hunting mandibles. But he’s part of a fantastic showcase of some of the smallest species living on RSPB reserves; it’s a bright, colourful, often gruesome but always fascinating world down there beneath our feet, and author Ross Piper’s entomological insight brings to life the secret little doings and dramas that we often overlook. Definitely check it out – you may awaken a new passion for looking down as well as up! Ross Piper continues exploring the insect underworld on what’s one of my favourite pages - page 17 - where you’ll be stopped in your tracks by the sight of hundreds of wood-ants squirting tiny jets of formic acid into the air, in defence of their teeming, labyrinthine underground city. Did you know that they even farm flocks of aphids, offering them protection in exchange for the aphids’ sweet ‘milk’? If humans worked together as efficiently as ants, we’d probably have peacefully colonised other planets by now. Amazing stuff. We've packed our Wild About section full of tips and fascinating insights into the natural world. 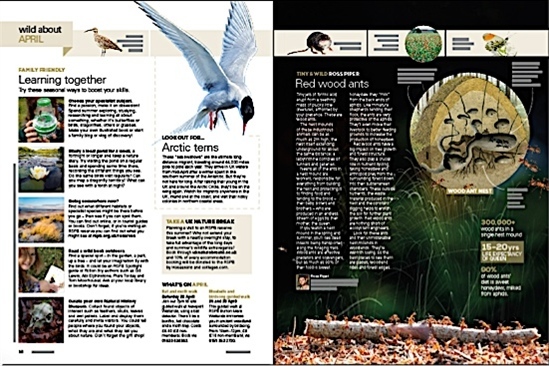 On page 43, we’ve brought together a selection of stories describing how nature can protect us from climate change. Water management is not only a key part of providing habitat for wetland, riparian and coastal species; it can also keep local towns and communities safe from flooding, and safeguard against drought as our climate changes. I love stories about rewilding – such as the restoration of Swindale Beck in Cumbria, where an RSPB partnership has restored an artificially straightened waterway to its natural curves, thus slowing the water flow and reducing flash flooding. These outcomes suggest that nature knows best, and that in a changing climate we should consider harnessing natural processes to protect ourselves. I hope that, whether you’re birder, hiker, biker, builder, photographer, gardener or animal lover, you’ll find something in this issue that inspires you among the riot of birds, wildlife and nature. We'll be expanding more on this issue's themes in the coming weeks, so watch this space - and comment below or email us to let us know what you think. If you’d like to donate to or join the RSPB and receive Nature’s Home, click here.